It's no secret that I love food and friends can testify how I can just go on and on for hours talking about it. So, it is also not a big surprise whenever acquaintances would ask me what my favorite food is or where do I normally go to when I want a surefire delicious meal. The funny thing is, I would sometimes end up a bit stumped on what the right answer should be. I guess it's because I've dined at more a thousand restaurants all over the region and this encompasses a wide range of cuisines too. One time, I really took a few minutes to think about it and the answer simple. There, I said it. If there's one thing that I love to eat in this world, it would definitely be a plate of pasta preferably cooked in an oil-based sauce with mushrooms, cheese, a simple choice of meat and spices. At the end of the day, I realized, nothing beats going back to basic. Pasta, to me, is the kind of dish that I would have whenever I had a long day at work. It's a pick-me-upper that never fails to put a smile on my face when something just went oddly wrong during the day. Colleagues here in the Lion City can also attest how I could go on the entire week having pasta every single day. When I first heard about Ah Bong's Italian, a hawker stall that sells fresh pasta dishes for only a few hours per day, I knew I have to go and try it soon. 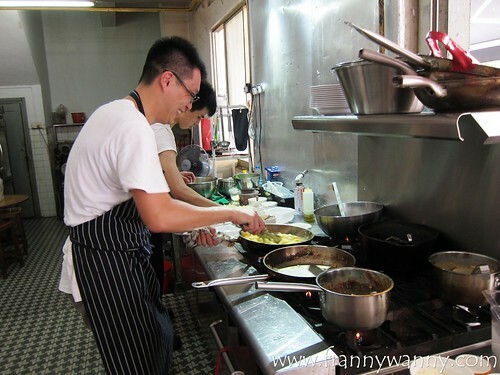 Ah Bong is actually owned by Chef Chris Ng who specializes in classical western (Italian) cuisine with a bit of Oriental touch. He named the restaurant after his daughter. This pasta stall shares the same store front with 3 other hawker vendors -- one was selling Yong Tau Foo, another selling Assam Laksa and a drinks stall. What's on his menu? Mac & Cheese (with the option to add truffle oil), Creme Brulee, and a few more. A classy line-up for a hawker setting don't you agree? Then again, who ever said that you can only have a proper Italian dish inside an air-conditioned room with an attentive server in a tuxedo at your beck and call plus some instrumental music piping at the background? This just goes to show that there's more to life than stereotypes. Agree? We got there a little past 12 and were surprised that more than half of the items in the menu were all sold out! WHAT?!?! Sadly, even the Mac and Cheese that I've been dreaming to try was all gone. Instead of sulking like a child in the corner, I quickly made my choice and tried the Ah Bong's Aglio Olio (S$6). Not a bad choice as it has it's name on it which could signify that it's a specialty and an aglio olio is a pretty straightforward dish too. I love farfalle pasta however I felt that this one was a bit under-cooked as the noodles were still a bit tough. Flavor-wise, it was a-okay but lacking the kick that I was expecting to taste. Sadly, this pasta choice was pretty mediocre and not something that I would try again. 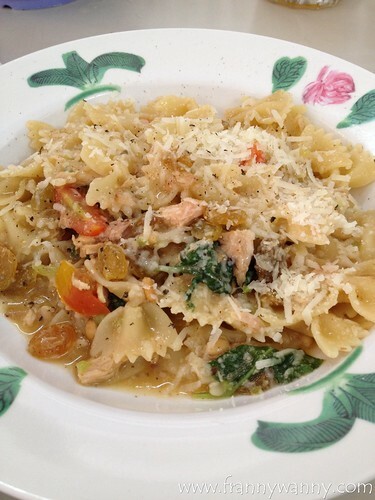 This was O's Fruit and Nut Pasta (S$6). 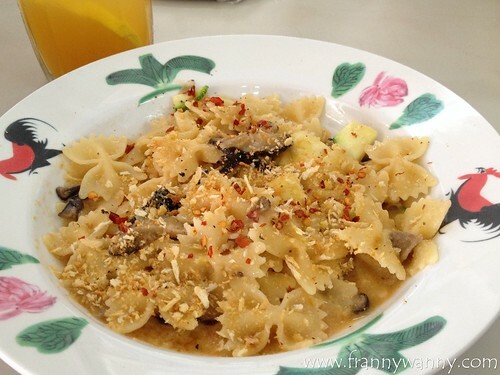 An interesting creation of farfalle noodles with tuna, pine nuts and raisins. I tried a spoonful and thought that it was at least more flavorful than my Aglio Olio. I'm just not a fan of the strong canned tuna smell and raisins. I guess I have expected way too much from Ah Bong's Italian but I'm definitely not one who gives up easily. 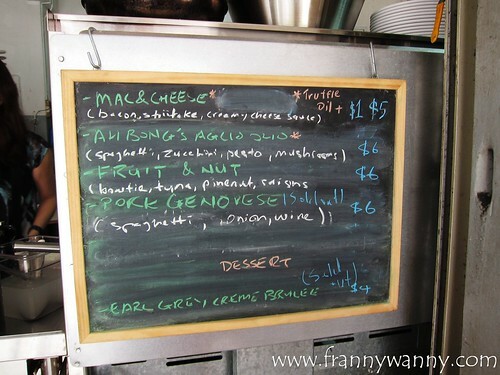 I can't wait to go back earlier this time to try his famous Truffled Mac & Cheese paired with the Earl Grey Creme Brulee. The good thing is that there's nothing beyond S$10 on the menu making this such a budget-friendly place. Till next time, Ah Bong's! 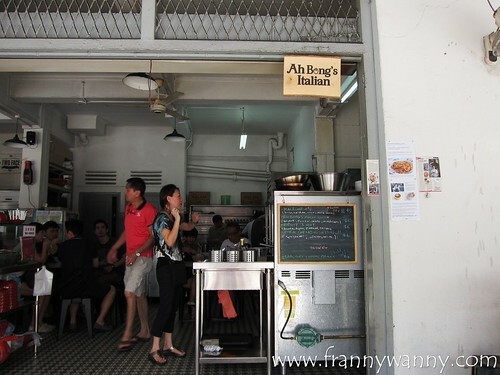 Ah Bong's Italian is located at 56 Eng Hoon street, #01-46 Singapore. They're open only from 10AM to 2PM Monday-Saturday. YEDY!!!! You have no idea how kilig I was when I found out that you left a comment!! :) I miss you guys too but I also do look forward to welcoming you guys here in SG! :D Hope to see you soon!